Vancouver Chinatown’s “Hot+Noisy” mahjong season is back for its third summer! The Youth Collaborative for Chinatown (YCC) will be setting up mahjong tables at Keefer and Columbia (Chinatown Memorial Square) twice a month on Saturday evenings, from early June to mid-September. One special highlight of the mahjong sessions is Portrait Day on July 21, when the YCC hosts Chinatown Pretty, the San Francisco-based Instagram group which celebrates the street style of Chinatown seniors. 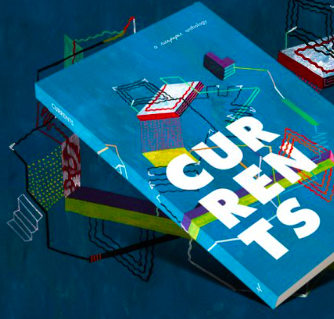 After the Chinatown Night Market was cancelled in 2013, its absence left a noticeable void the following year. Suddenly, the streets of Chinatown were quiet on Friday and weekend evenings. No atmosphere, no people. This was especially hard on the seniors with low incomes and restricted mobility. Some are bachelors, without families of their own. The Night Market had been a vital source of community and now it was gone. In response, June Chow, along with her sister and two friends, co-founded the YCC in May 2015. Playing mahjong at the YCC’s September 2017 social. PHOTO COURTESY OF YCC’S FACEBOOK PAGE. Their first project was creating the “Hot+Noisy” mahjong socials. The “Hot+Noisy” refers to the Chinese characters “熱鬧” (yeet naau in Cantonese or rènào in Mandarin), which means “lively” and “bustling with noise and excitement”, according to the Oxford Chinese Dictionary. The YCC wanted to make use of public space by introducing mahjong outdoors and recreate the “hot and noisy” atmosphere that had once been provided by the Chinatown Night Market. Mahjong is a game for four players based on 144 tiles. Each tile is roughly the size and shape of an ice cube and is labelled with Chinese characters. The game originated in China, but has since spread in popularity all over Asia. It is ideally played on specially-designed tables with a fat rim to facilitate shuffling of the tiles; some tables may have fancy features, like pull-out cup slots to hold drinks, and usually a drawer at each seating to hold cash, since bets are often placed. Mahjong is usually played at family parties with relatives. And it can get loud. The robust soundtrack of a mahjong game typically features long silences while the players concentrate, the occasional “Crack!” sound of tiles being discarded from a hand, the cry of a final “Pong!” by the winner, followed by wails of “Aiya!” by the three other players who lost the round. Then the shuffling of the tiles to start a new round creates a thunderous crackling sound. The YCC wanted to provide Chinatown seniors with “a safe and festive destination” during the summer—which also means no betting is allowed. 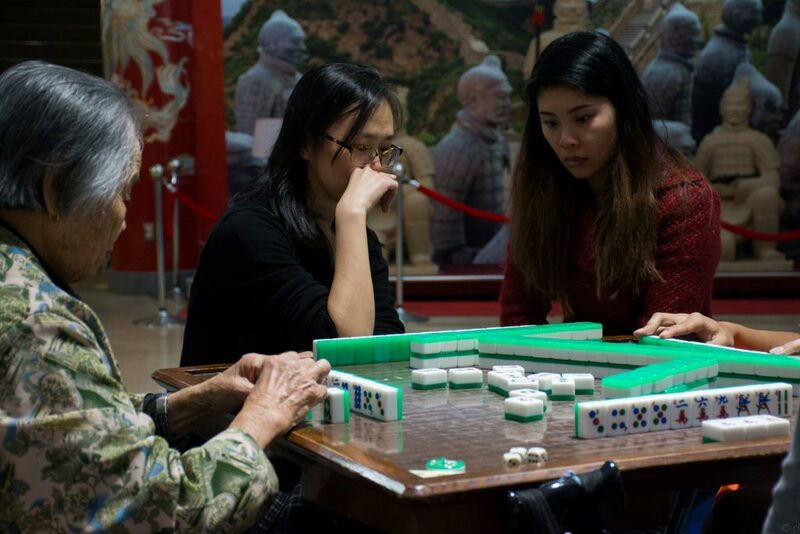 In addition, the mahjong socials give younger generations of local-born Chinese opportunities for meaningful interaction with seniors, and for learning cultural knowledge, such as how to play mahjong. There is also a serious purpose behind the mahjong socials. Heritage Vancouver just released its 2018 Top10 Watch List. For the third year in a row, Chinatown is on the list. The neighbourhood continues to be one of the most threatened sites in the city, and is at risk of losing its heritage character to commercial development. Mahjong socials are one of the activities that Heritage Vancouver recommends will encourage awareness of the neighbourhood’s cultural value. 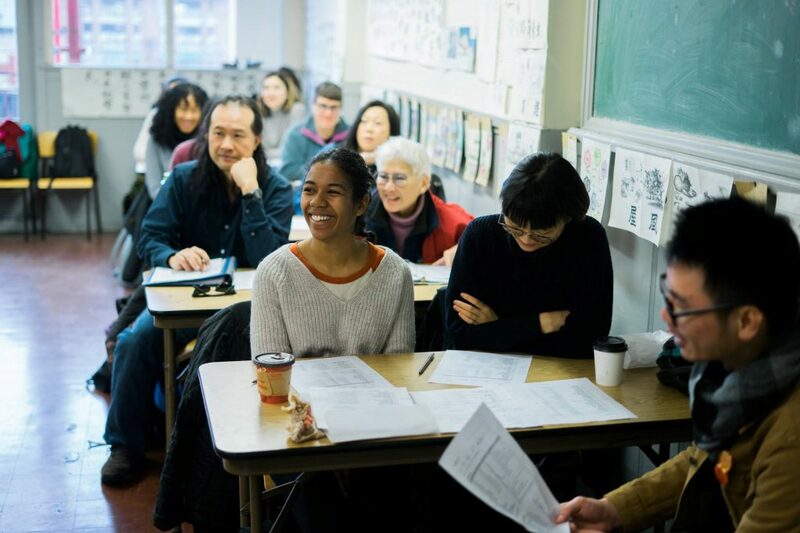 Another way can come from exploring the Cantonese language roots of Vancouver Chinatown through the YCC’s popular Mon Keang Chinese School for adult learners. For those Vancouver Gen-Xers who have bad memories of Chinese school, the Mon Keang School ain’t the Saturday program you attended as a kid in the 1970s or 1980s as a kid. First, the program is completely conversational, and focuses on learning practical Cantonese. There is no reading, writing, homework, or testing. So no worries about being forced to recite or dictate paragraphs from memory. 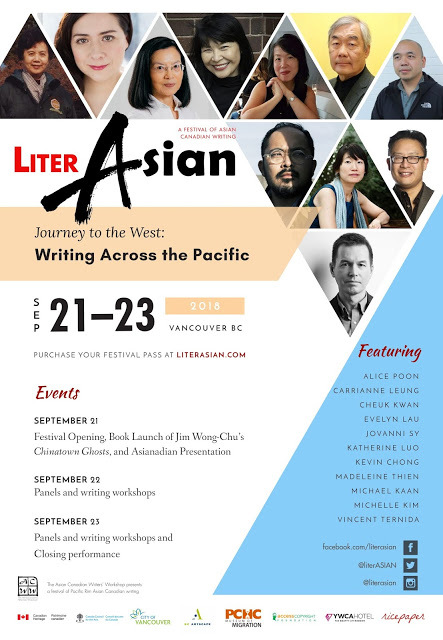 Second, the instructor is Zoey Lam, a PhD candidate in linguistics at UBC who is studying heritage Cantonese learning in Canada. Lam specifically designed the Mon Keang Saturday classes using progressive learning techniques from her research. And her expertise in linguistic andragogy is making an impact. Since its inception in 2016, the YCC’s Mon Keang Chinese School has often had to waitlist students due to high demand. And the adults signing up for Cantonese classes are a diverse demographic. “Only about 60% of the students are local-born Chinese,” says Chow. 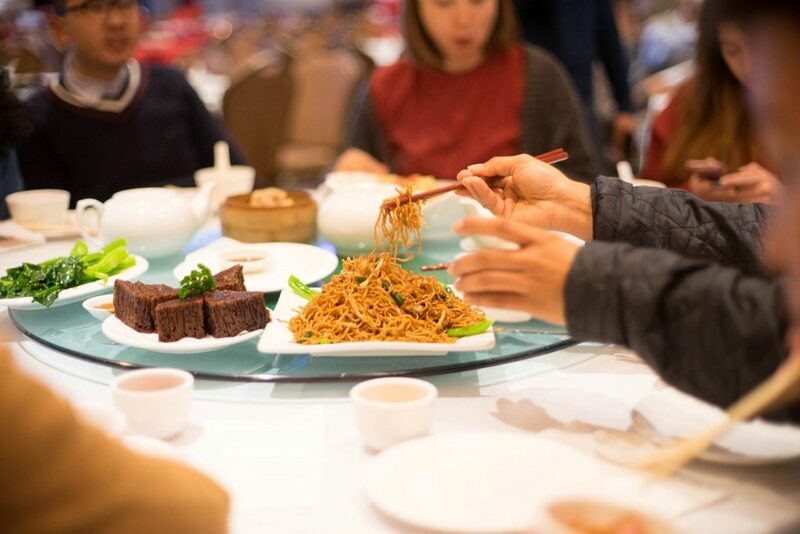 Another 20% are non-Chinese, in a relationship with an ethnic Cantonese person; the non-Chinese partners want to learn a few Cantonese phrases, presumably to impress potential in-laws, and to familiarize with Cantonese culture and etiquette. The final 20% are mixed-race, adults wanting to learn more about the Cantonese part of their identity. The first hour is spent in the classroom at the historic Mon Keang Chinese School. Located above the Wong Benevolent Association building since 1925, the Mon Keang Chinese School was closed for years and its existence mostly forgotten—until the YCC came along and revitalized use of the heritage facility. The program is eight weeks long. Learners begin a Saturday morning class by studying the basic vocabulary and phrases related to the theme, and practise with each other in the classroom. In the second hour, the adults are set loose on the streets of Chinatown for field study, where they practise the new skills they just learned with local merchants and program partners. 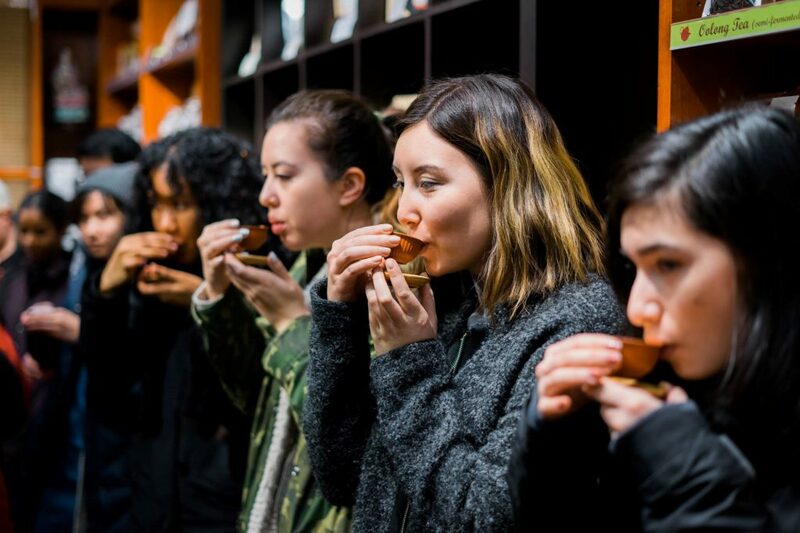 Each week features a different theme: One week, the lesson may be on Chinese tea, with a visit to tea master Daniel Lui at The Chinese Tea Shop. Another week, students learn how to order dim sum, and practise with a group meal at Floata Restaurant. 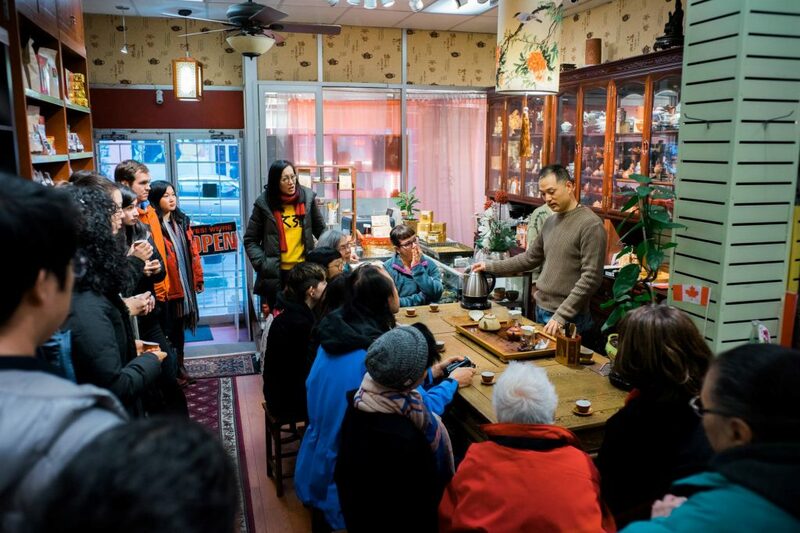 In addition to learning about food, students also learn about the public spaces and culture of Chinatown, such as the various clan associations. They even spend one Saturday observing a lion dance practise at the Hon Hsing Athletic Club. Trying out the new honey cake dessert at Floata Restaurant during the dim sum lesson. PHOTO COURTESY OF YCC’S FACEBOOK PAGE. Learners may be pleased to know that their $155 tuition goes right back to supporting the local economy of Chinatown. The tuition pays for the instructor and rent for the classroom, but also honorariums for the Chinatown merchants and program partners. Lam’s approach toward teaching Cantonese has been so popular, there have been requests for Mon Keang School to expand its beginner-level program and start an intermediate level this fall. Furthermore, Gen-Xers with children have been requesting that Mon Keang School start a children’s version as well using the same teaching methods: Place-based learning, and using the shops and peoples of Vancouver Chinatown for real-world practise. To learn more about the YCC’s Saturday School program, or register on the waitlist for Mon Keang Chinese School, click here.